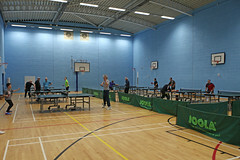 No sooner had the Bournemouth & District Table Tennis league come to an end the previous week than their annual Individual Championships got under way at the Grange last week. At the time of writing, the New Milton club has eight of its players competing in the finals, rising starlet Jack Trafford (pictured below) featuring in three of them. 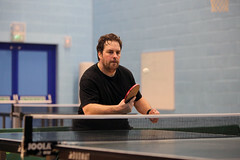 On the first Tuesday night Andy Tipsana (New Milton C) won his Div 1 semi-final and will face Matthew Stanfield (Bmth Sports) in the final. 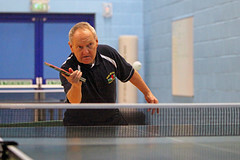 The club is assured of one of its players winning the Div 3 title as Graham Underwood from the promoted G team will take on Steve Cheesman (F team) who won the Div 4 individual title last season. On Wednesday night 13 year old Adam Titcombe (L team) won his semi-final and will test his mettle against Michael Komineck from Winton YMCA. Komineck only lost 3 out of his 48 league matches to give him a 94% winning average, but the rapidly improving Titcombe has no mean average on 89%. 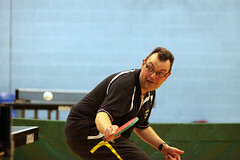 Thursday night saw New Milton players book their places in the Div 2 and Div 4 finals. 14 year old Jack Trafford from the C team will play Luke Hunt (Breamore) in the Div 2 final, and Ben Greene (J team) takes on the very tricky and experienced Richard Stroud (Merton) in the Div 4 final. 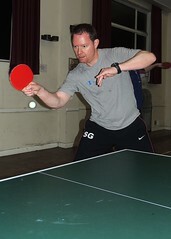 With the divisional events out of the way, Friday night saw Gerard Redman (New Milton C) dispose of A team club mate Steve Hemmings (last year’s runner-up) in their Vets 40+ semi-final. 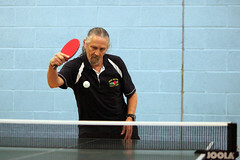 Redman will face fellow Div 1 player Ian Brown (League Results Secretary) from the Broadstone club in the final. 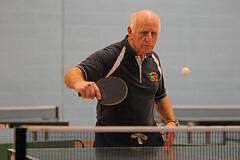 The tournaments resumed after the weekend break on Monday night with the Vets 60+, Junior U15 and Junior U18 events. 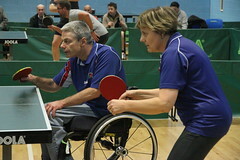 Milton’s England Veteran Brian Bickell from the Premier’s B team won his semi-final to take on Dave Nicholls who usually plays in Div 2 for the Ringwood club. Jack Trafford won both his Under 15 and Under 18’s semi-finals to respectively face Div 1’s Matthew Stanfield and Premier player Ali Malloch (both from Bmth Sports) in the finals. The following Tuesday night saw Brian Bickell win his Vets 70+ semi-final and he will play against last year’s winner Danny Allen (Merton) in the final, making it two finals for Bickell so far. At the time of writing there are still three events to go (Vets 50+, Bournemouth Closed and Bournemouth Handicap) so there is still a bit more scope for Milton to add to its laurels (watch this space!). All the deciders will be played on the Grand Finals Night to be held on Friday 31st March at the Grange School Sports Hall, Somerford. Retired Accountant. Ardent Saints fan! New Milton TTC Treasurer and Press Secretary. Winner of the ETTA Press Officer of the Year 2009. BDTTA Results Secretary. Posted on 29/03/2017, in 1. News, 3. Club achievements. Bookmark the permalink. Leave a comment.